Dom Marsala looks set for long spell on the sidelines after he suffered ruptured medial ligaments in the 4-0 defeat to Lye Town in the FA Vase. 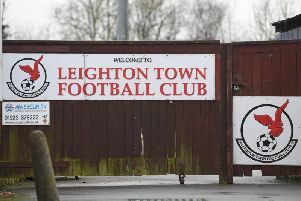 Town were reinstated into the competition as a result of Leverstock Green fielding an ineligible player during their second round win over Leighton. But Town came off second best in all aspects - not only suffering a heavy extra time defeat in the third round clash, but losing key man Marsala in the process. Heading into the game, Leighton were four undefeated, but were soon on the back foot against Lye Town. While neither team dominated the first period, but Lye definitely had the better of the chances. Jack Till tested Charlie Jones after he broke clear down the right hand side, but Jones was equal to his effort and saved excellently at the wide-man’s feet. Till then had another great chance but he fluffed his lines and fired wide from close range. Lewis McBride suffered a head injury though and had to be replaced at half time, before Marsala’s knee injury dealt Town yet another blow early in the second half. After the lengthy stoppage for Marsala’s injury, any pace was taken out of the game as it cruised to a drab 0-0 and the prospect of extra time. But in the added half an hour, it would be Lye who would take the game by the scruff of the neck, aided when Matt Brady was given his marching orders for a second yellow. And it opened the floodgates for Lye, with first Josh McKenzie getting the final touch to a goul-mouth scramble to give the hosts the lead. Adam Mercham made it 2-0 shortly before the break when he headed home a Lye corner, putting the game effectively out of reach. But they did not stop there, with Ben Billingham rounding Jones to roll home a third in the second period, before Luke Carter finished off a fourth, ending Town’s FA Vase run for a second time in quick succession. Next Saturday, Town host Arlesey in the league.